Paris, 1891. 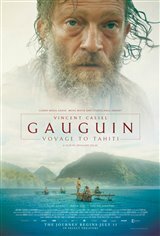 Unable to make ends meet for himself and his family, painter Paul Gauguin (Vincent Cassel) decides to move to the Marquesas Islands so he can paint the wilderness. At the last minute, his wife announces she will stay in France with their five children. The announcement annoys him but, at the same time, frees him. Settling in a hut on the outskirts of a Tahitian village, the penniless painter paints at all hours of the day, then at night, leads a dissolute life. His fragile health leads him to the dispensary, where he meets Dr. Henri Vallin, who becomes his friend. Against the advice of the latter, Gauguin ends his treatment and goes on an excursion to the mountains. The Maori people, who discover him unconscious, welcome him among them and offer him Tehura, the daughter of the chief, in marriage, on the promise that he will make her happy. For a time, this is what happens and Gauguin makes the young woman the subject of his biggest paintings.